Updated on April 11 at 4:40 p.m. ET. 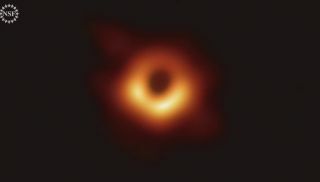 This week, Earthlings first laid eyes on an actual image of a black hole — turning what lived only in our collective imaginations into concrete reality. The image depicts an orange-toned lopsided ring circling the dark shadow of a black hole that gobbles up matter 55 million light-years away at the center of a galaxy known as Virgo A (Messier 87). This blurry first look is enough to confirm that Einstein's theory of relativity works even at the boundary of this giant abyss — an extreme location where some thought his equations would break down. But this elusive image raises lots of questions. Here are some of your questions answered. Black holes are extremely dense objects that nothing, not even light, can escape. As they eat nearby matter, they grow in size. Black holes usually form when a large star dies and collapses onto itself. Supermassive black holes, which are millions or billions of times as massive as the sun, are thought to lie in the center of almost every galaxy, including our own. Our's is called Sagittarius A*. Why haven't we seen an image of a black hole before? Black holes, even supermassive ones, aren't that big. For instance, taking an image of the black hole at the center of our Milky Way, which is thought to be around 4 million times as massive as the sun, would be like taking a picture of a DVD on the surface of the moon, Dimitrios Psaltis, an astrophysicist at the University of Arizona, told Vox. Also, black holes are typically shrouded by material that can obscure the light surrounding the black hole, they wrote. Before this image, how did we know black holes existed? Einstein's theory of relativity first predicted that when a massive star died, it left behind a dense core. If this core was over three times as massive as the sun, his equations showed that the force of gravity produced a black hole, according to NASA. But until yesterday (April 10), scientists couldn't photograph or directly observe black holes. Rather, they relied on indirect evidence — behavior or signals coming from other objects nearby. For example, a black hole gobbles up stars that veer too close to it. This process heats the stars, causing them to emit X-ray signals that are detectable by telescopes. Sometimes black holes also spit out giant bursts of charged particles, which is, again, detectable by our instruments. Scientists also sometimes study the movement of objects — if they seem to be pulled weirdly, a black hole could be the culprit. What are we seeing in the image? Black holes themselves emit too little radiation to be detected, but as Einstein predicted, a black hole's outline and its event horizon — the boundary beyond which light can't escape — can be seen. It turns out, that's true. The dark circle in the middle is the "shadow" of the black hole that is revealed by the glowing gas that sits at the event horizon around it. (The extreme gravitational pull of the black hole superheats the gas, causing it to emit radiation or "glow"). But the gas in the event horizon isn't really orange — rather the astronomers involved in the project chose to color radio-wave signals orange to depict how bright the emissions are. The yellow tones represent the most intense emissions, while red depicts lower intensity and black represents little or no emissions. In the visible spectrum, the color of the emissions would probably be seen with the naked eye as white, perhaps slightly tainted with blue or red. You can read more in this Live Science article. If you take an ordinary photo that contains millions of pixels, blow it up a few thousand times and smooth it out, you'll see about the same resolution as seen in the black hole image, according to Geoffrey Crew, the vice chair of the Event Horizon Telescope. But considering they are imaging a black hole 55 million light-years away, that's incredibly impressive. Why is the ring so irregular in shape? The mission scientists don't yet know. "Good question, and one we hope to answer in the future," Crew said. "For the moment, it's what M87 has shown us." How did scientists capture this image? Over 200 astronomers around the world took the measurements using eight ground-based radio telescopes collectively known as the Event Horizon Telescope (EHT). These telescopes are typically located at high-altitude sites such as volcanoes in Hawaii and Mexico, mountains in Arizona and the Spanish Sierra Nevada, the Atacama Desert and Antarctica, according to a statement from the National Science Foundation. In April 2017, the astronomers synchronized all the telescopes to take measurements of radio waves being emitted from the event horizon of the black hole, all at the same time. Synchronizing the telescopes was akin to creating an Earth-size telescope with an impressive resolution of 20 microarcseconds — enough to read a newspaper in the hands of a New Yorker all the way from a cafe in Paris, according to the statement. (In comparison, the black hole they imaged is about 42 microarcseconds across). They then took all these raw measurements, analyzed them and combined them into the image that you see. Why did the scientists measure radio waves rather than visible light to capture the image? They could get better resolution by using radio waves than if they used visible light. "Radio waves currently offer the highest angular resolution of any technique at present," Crew said. Angular resolution refers to how well (the smallest angle) a telescope can discern between two seperate objects. Is this an actual photograph? No, not in the traditional sense. "It is difficult to make an image with radio waves," Crew said. The mission scientists measured radio waves being emitted from the black hole's event horizon and then processed that information with a computer to make the image that you see. Does this image yet again prove Einstein's theory of relativity? Yep. Einstein's theory of relativity predicted that black holes exist and that they have event horizons. The equations also predict that the event horizon should be somewhat circular and the size should be directly related to the black hole's mass. Lo and behold: a somewhat circular event horizon and the inferred mass of the black hole matches estimates of what it should be based on the movement of stars farther away from it. You can read more on Space.com. Why didn't they capture an image of our own galaxy's black hole, instead choosing one far away? M87 was the first black hole researchers measured so they first analyzed that, Shep Doeleman, the Event Horizon Telescope's director, said during a news conference. But it was also an easier one to image in comparison with Sagittarius A*, which sits at the center of our galaxy, he added. That is because it's so far away that it doesn't "move" much during the course of an evening of taking measurements. Sagittarius A* is much closer, so it's not as "fixed" in the sky. In any case, "we're very excited to work on Sag A*," Doeleman said. "We're not promising anything, but we hope to get that very soon."